Published by UCD Press, Dublin 2014. It is not too much of an exaggeration to say that at the age of just 24, Frank Aiken held the future of Ireland in his hands. After succeeding Liam Lynch as Chief of Staff of the anti-Treaty IRA in April 1923, he first called a unilateral ceasefire and then about a month later, issued an order to ‘dump arms’, ending the Irish Civil War. This books is about how he, the son of a ‘respectable’ strong farmer and constitutional nationalist in South Armagh got to this position. Aiken joined the Volunteers at the time of the Ulster crisis of 1913-14 and said he was ready to fight in the insurrection at Easter 1916, but in fact none broke out in his district. He rose to prominence through political activism in 1917-18 as Sinn Fein fought a number of by-elections in the region and then a general election. As a result of his commitment to the separatist cause Aiken himself was elected as chairman of the local Sinn Fein county organisation. However it was as fighter that Aiken really became influential in the republican movement. Matthew Lewis makes the point that during guerrilla war in Ireland in 1919-21 it was the presence of tough and competent IRA leaders, combined with a small number of dedicated guerrillas that made the difference between an active area and an inactive one. Such was the case with Frank Aiken, who worked his way first to the top of the Newry Brigade and following IRA reorganisation, to commander of the Fourth Northern Division. Grandiose titles aside, what this meant was that Aiken led a relatively small band of guerrillas, based both in Newry town and the South Armagh/South Down countryside in attacks on state forces – primarily the police (Royal Irish Constabulary and later Ulster Special Constabulary) and more rarely the British military as well as in shootings of civilian enemies and collaborators. Numbers expanded after the truce, and for a period Aiken’s command more resembled a regular military, with up to 300 men, relatively well armed and based in the military barracks in Dundalk after the British evacuated it. From there they waged an intensified campaign on the new unionist and British forces across the new border in Northern Ireland – the area being formally partitioned in late 1921. The civil war however shattered this force, Aiken tried to stay neutral in the conflict but was arrested by pro-Treaty troops. Although he famously retook Dundalk barracks and the town from pro-Treaty forces in a raid in August 1922, Aiken was shortly afterwards reduced again to small scale guerrilla warfare, but this time against Irish Free State troops. A gradual process of attrition, arrests and lack of political support and military means led eventually to Aiken’s ‘dump arms’ order in May 1923, effectively closing the curtain on the Irish revolution. Aiken was brave; he led attacks on RIC police barracks personally and after an ambush on Crown Forces went wrong, he covered the retreat of the IRA party with the only working rifle left in the squad. He also had a ruthless streak, we learn, threatening to shoot IRA Volunteers who tried to run away in their first experience of combat and actually shooting, or having shot, a number of rival nationalists from the Ancient Order of Hibernians in 1921 and, notoriously, six Protestant civilians in a reprisal in June 1922. Beyond that we do not learn a great deal more in this book about Frank Aiken as a young man and guerrilla commander. One problem is that Aiken himself was famously reluctant to talk about the revolutionary years in later life. Perhaps this is not terribly surprising. As Irish Minister for Foreign Affairs and representative at the United Nations in New York, Aiken hardly wanted to publicise the fact that he had once been in the business of ordering the deaths of suspected informers the abduction of prominent unionists (in retaliation for the arrest of republicans) and the burning of their homes. But a wider problem with this book I felt was that it is really not a biography of the young Frank Aiken at all. Aiken, as Lewis writes, grew up in a strongly Catholic and nationalist enclave of south Ulster with a strong tradition of social banditry and at times sectarian violence with the Protestant majority to the north. Inevitably the conflict of 1919-22 involved basically inter-communal violence as well as war on the British state. While this is discussed in detail, Aiken’s attitudes to Irish freedom, the idea of the Republic and his thoughts about unionists and partition are not. Nor do we hear anything about his personal life or other motivations in this period. This is not an intimate portrayal of Aiken himself or of society along the new border but narrowly focused examination of the IRA in this area. So if I have a criticism it is that this book is rather narrowly focussed, being only a discussion of what the IRA did in the narrow zone from Newry to Dundalk and from the sea to Crossmaglen. There was scope here for a more intimate portrayal not only of Aiken himself but also of the effect of so much political violence on a small and mostly rural society along the new border. (According to very useful Appendix contained in the rear of the book, over 100 people died violently in this small area from 1919-1923 with another 150 wounded). There is a useful social portrait of the local IRA (more egalitarian than the constitutional nationalist but dominated in leadership positions by the rural middle class like Aiken himself) but discussion of what local republicans believed they were fighting for is also undeveloped. That said, there is no faulting the thoroughness of the research here. It set this reviewer right on a number of points; for instance Aiken’s attack on a British troop train in 1921 (in which 4 soldiers and dozens of horses were killed) involved derailing the train not blowing it up with a mine as I had believed. And Aiken did not, as has been alleged, take a Protestant Church congregation hostage in order to lure the Ulster Special Constabulary(USC) into an ambush, he held both Catholic and Protestant Church goers in a pub so they would not be caught in the crossfire during the planned ambush. Lewis has a measured take on the various historical controversies that surround Aiken’s career as guerrilla leader. He argues that in the Fourth Northern Division area during the War of Independence, the IRA was nowhere near beaten at the time of the truce, but that violence was of a persistently low level and was therefore in essence symbolic of the refusal to accept British rule rather than militarily formidable. Lewis has a measured take on the various historical controversies that surround Aiken’s career as guerrilla leader. While killings and reprisal by the IRA and the USC ratcheted up in 1921 and especially in early 1922, he argues that at no point was the IRA campaign explicitly sectarian. Even in the notorious revenge killings Aiken ordered at Altnaveigh in June 1922, in which six local Protestant were murdered in revenge for USC killings and sexual assault of local Catholics, Lewis argued that the motivation was primarily political rather than religious. The IRA took revenge on what it believed to be an ‘Orange area’ which had heavy recruitment into the USC, at a time when republicans believed that, due to the pervasiveness of the Specials, there were in the words of one no longer any unionist civilians. Lewis argues that south of border, Aiken ordered the protection of local Protestants and tried to halt harassment of them. While Aiken’s sanctioning of the killings at Alnaveigh was out of character, and while he was sorely provoked by the killing of unarmed nationalists and sexual assault of women he knew the night before, I feel this judgement lets him off a little lightly. If all Protestants in Northern Ireland were to be considered ‘legitimate targets’ (and Catholics likewise) on the grounds of their presumed political allegiance, this would have been the first stop towards all out communal war. Fortunately both sides ultimately held back from the brink of this logic. The Altnaveigh killings of June 1922 were, Lewis writes, not strictly sectarian in that they were an attack on Northern unionists rather than Protestants in general. Apart from Altnaveigh, Aiken’s most controversial action in the revolutionary period was his non-participation in the ‘Northern Offensive’ planned by the IRA on Northern Ireland in May 1922. Aiken was supposed to have led his Fourth Northern Division over the border into Newry but in fact did nothing. Lewis makes the point that this is not really as inexplicable as it looks. For one thing the Offensive was probably too ambitious, envisaging holding large areas of Northern Ireland despite a heavy British military presence. Aiken was concerned that his division was not well-enough armed and he was not the only one. Three other Divisions also got cold feet amid prevarication and dissension between pro and anti-Treaty IRA elements over the supply of arms from Dublin. For another thing, according to some sources Aiken actually received an order from Michael Collins calling off the offensive for now. There are a myriad of murky possibilities and Lewis sensibly concludes that the truth behind Aiken’s inaction is probably one or both of these factors. In ending the Civil War in May 1923, Lewis makes the point that Aiken was not giving up on his goal of a united, independent Ireland but rather helping to promote a compromise between Irish nationalists, which he had in fact also been trying to achieve at the start of the internecine conflict. To conclude this is a useful book, full of well grounded research. Arguments are carefully considered and clearly put. It works well as a companion to the biographical collection on Aiken published earlier this year. However for an intimate portrait of the man and his region, the reader will have to look elsewhere. Written by: John_Dorney on 20 November, 2014.on 23 January, 2019. One Response to "Book Review: Frank Aiken’s War, The Irish Revolution 1916-1923"
My comments on this book fall under three headings: the pre-Truce / pre-Treaty period, the first half of 1922 and the Civil War period. In contrast to the review above, I actually thought the early part of the book, dealing with Aiken and the 4th Northern Division in the run-up to the Truce and Treaty, were the strongest section of the book. I thought Lewis brought a lot of interesting new material to bear to flesh this out, particularly that from Kilmainham Gaol Museum, not an archive that you see referenced too often in most histories of the period. Aiken’s rise to local prominence and the reasons for it are well documented here, as are the operations of his command during the War of Independence. I can understand the frustration behind “…Aiken’s attitudes to Irish freedom, the idea of the Republic and his thoughts about unionists and partition are not. Nor do we hear anything about his personal life or other motivations in this period.” However, it’s worth bearing in mind that senior IRA/SF figures who went on to become Fianna Fáil ministers did not generally leave behind memoirs of their careers – I believe the practice was frowned on by their “Chief”. The only notable exception to break rank was Belfast-born Joseph Connolly, who had been a Republican consul to the States and who was the last member of the Seanad to hold cabinet rank, in de Valera’s governments during the early ‘30s); Aiken, however, kept silent – at least in print. In that context, his interview for the famous Ernie O’Malley notebooks might have been referenced more but it doesn’t seem to crop up here as often as you might expect, given the lack of other first-hand testimony from Aiken himself. As regards the post-Treaty / pre-Civil War period, I have two criticisms. The first is that Lewis adopts too narrow a focus and concentrates too much on Aiken’s 4th Northern Division, to the relative exclusion of the other Northern Divisions. I agree with his analysis of the IRA Ulster Council being a sop to keep the truculent northerners in line over the Treaty, but given Aiken’s chairmanship of that group, I would have expected a wider perspective encompassing the thinking and actions of the other divisions. Similarly, the over-narrow focus on what was happening in south Armagh and Louth means that the participation of the southern anti-Treatyites in the planning and execution of the May 1922 Northern Offensive – other than their involvement in smuggling arms to the north – is almost entirely neglected, as are the implications of their involvement: who got them involved and why might have provided scope for interesting analysis. Secondly, Lewis seems content to sit on the fence regarding the reasons for the eventual non-participation of the 4th Northern Division in that Offensive. Although he presents the contrasting evidence of Patrick Casey and John McCoy (and throws interesting light on why those two individuals may have formed the views they did), he shies away from forming a conclusion as to the existence of a countermanding order from GHQ and the implications of such an order. Again, a wider perspective could have helped him reach a conclusion, given the availability of evidence from outside Aiken’s own Division. As regards Aiken’s involvement in the Civil War, I felt this section of the book simply flew past far too quickly. While his attempts to maintain unity in face of the impending breakdown and the re-capture of Dundalk barracks after the War had started are explored in some detail, Aiken and his men then seem to subsequently drop from view, he is sick for a period around late 1922 and early 1923, then all of a sudden he becomes Chief of Staff after the death of Liam Lynch. Given his avowedly neutral stance during the initial IRA split, again at the outset of hostilities and his Division’s less than stellar record during the Civil War, this must have come as something of a surprise elevation, even to some of those on the anti-Treaty side. Other than a lack of other suitable candidates, the reasons for his promotion and the evolution of the views of the anti-Treaty leadership are not really explored in depth. 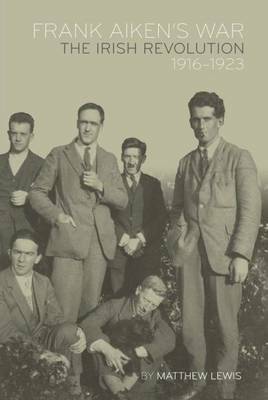 Overall though, I thought the book was a useful addition to the still-sparse work that has been done on the post-Home Rule events of the period in the North. However, what is its strength in the first half – a detailed look at what happened in Aiken’s own fiefdom – is arguably also its weakness in the second half: a failure to pull the camera back to allow a wider angle, allowing a bigger picture to be shown.